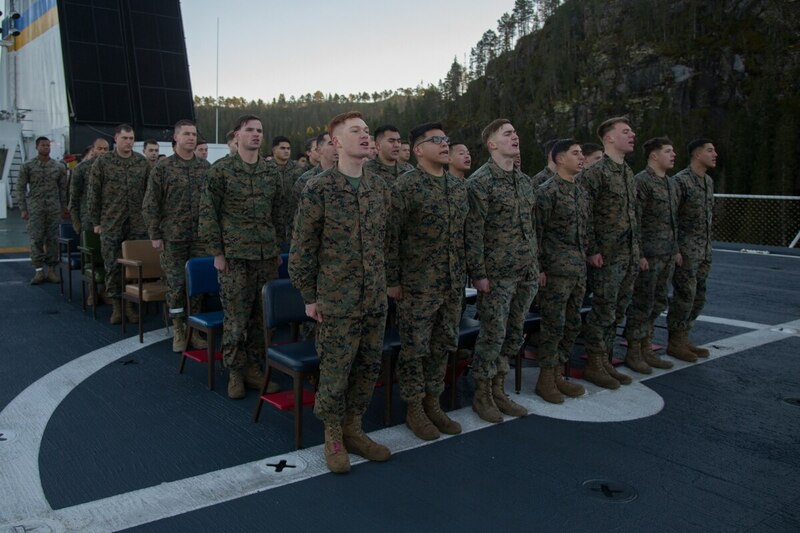 Marines better make sure they remember all the words to the Marines’ Hymn come April 15, because the top Marine wants you to sing it out loud when it’s played, according to Marine officials. That’s one of a slew of changes coming to the Corps’ new drill and ceremonies manual, which is expected to be published around April 15, Training and Education Command Sgt. Maj. William J. Grigsby told Marine Corps Times in an interview. “It is now directed that Marines, present and who have served honorably, who are not in formation or part of an actual ceremony, or marching in a parade or review, who when they hear the playing of the Marines Hymn will stand at attention, face the music and sing the words to the Hymn,” the updated drill and ceremonies manual reads. Previously Marines were directed to stand at attention during the playing of the Corps’ official song, the Marines’ Hymn ― a tradition that dates back to just after World War II. Other major changes include the removal of the complicated drill movement known as “stack arms,” various modifications to the Marine birthday ball ceremonies, and added language to former Commandant Gen. James Conway’s direction that the Marine ball ceremony include a reference to fallen comrades. The seven-mile stretch of road will play "The Marines' Hymn" when cars drive over it. Conway’s call for a reference to fallen comrades during the Marine ball originally was published in a Marine message, but was never included in the official drill and ceremonies manual until now. And stack arms is a difficult drill movement where Marines skillfully stack their rifles in groups of five without dropping a rifle. That maneuver has now been removed. The Corps’ hallowed drill and ceremonies manual was written in 2003 and last updated in 2006. The task to overhaul the drill manual was spearheaded by Gunnery Sgt. Zane Moorman, a former regimental drill master aboard the recruit depot at Parris Island, South Carolina. Moorman worked with other drill masters at Parris Island, San Diego, and Officer Candidates School aboard Quantico, Virginia, for more than one and half years to refine the drill manual. That effort kicked off around October 2017 when Moorman flew to Quantico to meet with Grigsby, Moorman told Marine Corps Times. They looked at “what was broken and what needed to be fixed,” Moorman said. Out of the nearly 600 page manual, there’s roughly 300 pages of changes, but a lot those changes include updating photographs that display Marines in outdated uniforms, according to Grigsby. For example, the old manual included photographs that showed Marines in the old tricolor woodland utilities. The updated manual displays Marines in the digital camouflage utilities. The updating of the drill manual is important: Drill is about self-discipline that creates unit pride, Grigsby said. The updated drill and ceremonies manual has been approved by Sgt. Maj. of the Marine Corps Ronald Green and the commanding general of Training and Education Command Maj. Gen. William F. Mullen. The manual is currently at Records, Reports, Directives & Forms Management Section with Headquarters Marine Corps and is awaiting a final signature from the commander of Marine Corps Combat Development Command Lt. Gen. David Berger. Berger was just recently nominated to replace Gen. Robert B. Neller as the next top Marine.